The new owners of one of Scotland's most remote restaurants have said their business is being threatened since a train derailment in June. 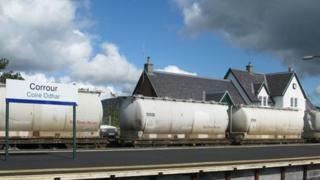 A 24-wagon freight train derailed between Corrour and Tulloch on the West Highland Line. Freight wagons, recovered from the scene, have been left in front of the Corrour Station House, which has become hidden from the view of passing trade. Lizzie Mackenzie said no-one seemed to know what was going on. She told BBC Scotland: "When the train stopped you would normally see the restaurant but now there are six big wagons right in front of us so you can't see the restaurant at all." She said the beautiful views of the Munros were spoiled by the wagons. "There's not much to see out of the window at the moment which is not nice for the diners who come to see beautiful surroundings," Ms Mackenzie added. "We are actually 17 miles from the nearest public road so all our business comes via the train." Network Rail said the wagons would be moved once an action plan was approved and agreed with the owners of the containers.